Do you know if they rid of wood lice? It really varies to whether they work on wood lice, wasps, spiders etc as some people find they work and others find they work on some things but not others, probably depends on what area you live in. Mine has been in for 5 weeks now and I have noticed that all insects have moved as far as possible away from repeller but are still in property. When first in wood lice seemed to enjoy the repeller (could see better as nothing was in room, however I don’t know if this is still the case as furniture now takes up most of room). But yeah does seem to be pot luck, if wood lice are your only problem maybe better to try a dehumidifier instead as wood lice really need moist places to live so drying it would definatly stop problem. have now had 2 of these machines plugged in for about a week and only seen one tiny spider and a daddy longlegs but no big ones thank goodness! it hasn’t rained in that time though so the real test will be thursday onwards, 3 days of rain forecast. was worried it would affect my 2 cats but they have been fine. I bought 2 of the vermatik 6in1 pest repellers from bid tv last november.Well i have never had a problem with mice befor but low and behold two weeks ago a mouse found its way in to my kitchen.It seems to like cat food.It comes out at night when we are tucked up in bed.The next mourning i will find mice poo all around the cat food dish.You would think the cat would get rid of it but no he is fast asleep when all this is going on.The best of it is the repeller is only two feet away from the mouse.So i would definitely say that the repellers are just one big con. Hiya all, updare from 11/10/07: ive been getting on fine with out the beasties in my new place its wonderfull, and there is a big field at the back of me too, I dont think they are a con because if they were no one would sell them cos every one would say they dont work so they must work, may be yours are faulty in that case send them back. Im sure if people like sit-up tv sell them they have to work or they will be breaking the law im sure…. But i think the pest repellers are a god send!! need to get some for my cousin who has a mouse problem and she doesnt own a computer (strange i know especially in this day and age) has any one got the 6 in 1 what they like? Hi sue,the pest repellers i had were the 6in1,I say were because i have returned them to sit-up tv.I have allso done abit off research on the web about pest repellers,and i found a pest controll site in canada, and they say that there is no evidence that repellers work,and they say if they did work then why are the pest controll companys not useing them.Any way caught the mice in a humane trap with abit of peanut butter,so all is well. My son has pass on one of these pest repellents but with no instructions would you possible tell me how the different positions of the slider knob work please. Hi Roy, you should be able to just download them. Here’s the inside and outside cover of the leaflet. Hope it helps! 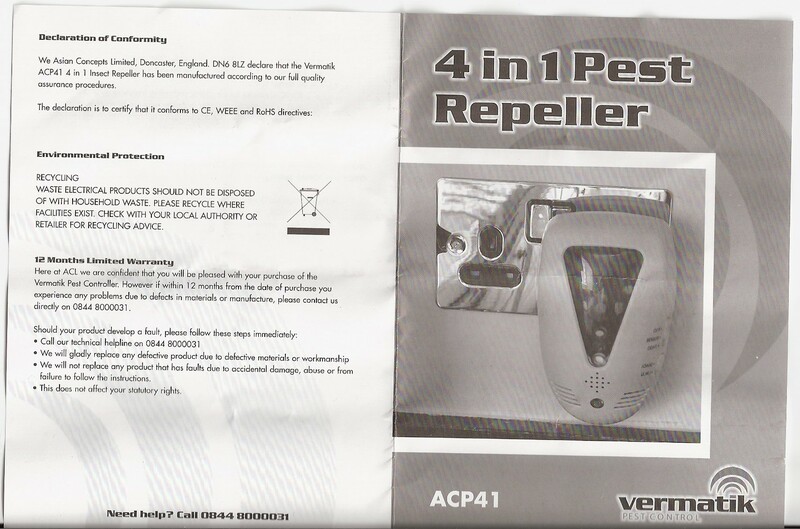 I brought my 4 in 1 pest repeller last year because I had a problem with ants’ invasion in the house. They build their nest under the house and they were running me mad. Any year in spring – summer were marching in my kitchen does not matter how clean I was keeping it. In the hall way I found the dead ants with wings (male ants) every night. After one year I am ants free in the house but they moved in the garden and they are making huge termite nests. My daughter suggests buying another repeller so I will increase the area of working (it is quite limited to a room). It is possible to work but I will move the ants to my neighbours so I decided to kill them if I can so I placed ants traps with honey and poison hoping to kill their queens. If anybody has experience with killing ants for good please let me know. What is it with spiders coming in pairs?! Last weekend spent ages building up the courage to splat a GIANT spider hiding behind the bathroom door then after waiting to make sure it was dead and flush it away- there was it’s friend under the sink- he was faster and far more clever! Have been researching these pest controllers as I can’t deal with the heart attack inducing size of the spiders that have taken a liking to my bathroom, am hoping that I have the same success as others! My repeller has now been in for 19 weeks and I still have spiders but only tiny ones now – noticed it even more so when I stayed at my mums last week there was one that was huge with hairy legs and Dr Martins on. The ones I have are daddy long legs (must admit these do get v big in my home but they usually stay out of sight under cupboards) and tiny normal ones I mean tiny, no bigger than a 5p coin. And I didn’t realise that the woodlice had gone until I saw one two days ago and realised I hadn’t seen any for weeks. I think the repeller is fab but could also do with an insect repeller too. Just got one of those electromagnectic spider repellents as we have BIG spiders here one after the other! I hate them and can not rest if there is one in the room. Ive had it plugged in for a week and can see no difference.Is it too soon?? My cat however will not enter the room it is in. He CAN hear it! I have had to move it to a room that is not used by him. Hi Amanda, I think it probably is too soon to tell after a week, I think mine took about 6-8 weeks to scare all the biggies off. I have a 6-in-1 repeller so not sure what the others ‘features’ have but there should be a slider on the side that sets it ‘on full’ (if you have no pets) ‘off’ and ‘on with pets’ if yours has this option definatly choose the latter as you feline friend will probably have huge headaches otherwise. The latest news with mine is that a couple of weeks ago Woolies had a sale on all the summer lines and I managed to get two canisters of Raid Crawling Insect Killer for £1 each. Very glad about this as 2days later I moved the mat I keep my shoes on and a HUGE spider ran out and ran under sink cupboard – I sprayed the area and saw another equally huge one run around for about 6 seconds (felt much longer tho) before dropping dead. I bought a chalet in March and am planning on living there the 8months a year that its open as site fees are much cheaper than renting but this first year has been a learning curve and a half. The chalet is wooden (so basically a glorified shed) the front door leads into the kitchen and then the lounge and either back corner of the lounge has a small bedroom the one on the left I use as my bedroom and the right hand room is a study come junk room. Next to the right room is a bathroom and toilet room. 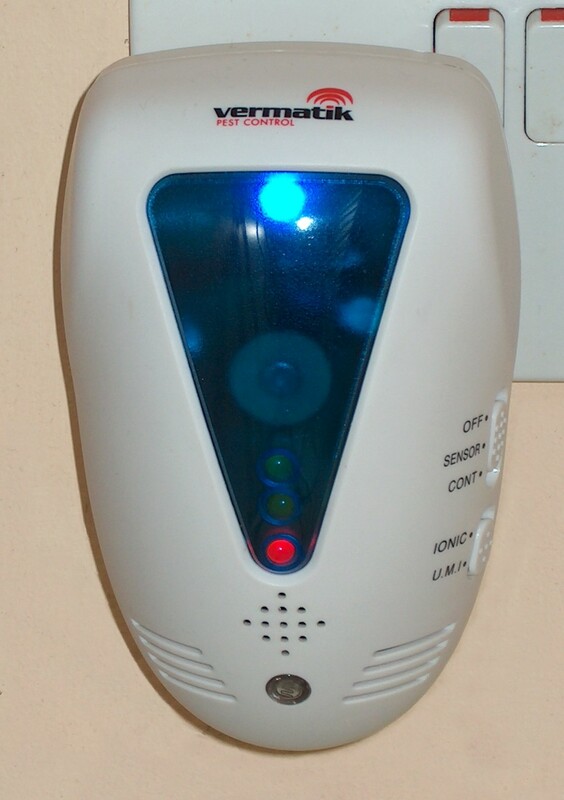 My main problem areas are the toilet/bathroom and the kitchen area but have the repeller in my bedroom – seems daft but it does warn that it should not be used near other electrical devices so that was the only place I could put it. I’m sure the distances stated are wrong as from the corner of the repeller to the other corner of the chalet can’t be more than 12 metres. Does anyone else have any problems with where to place the repeller? Or does anyone have it plugged next to a TV etc with no problems? The true test for me will come in March when the site reopens after 4months of being closed – with no electric – I am dreading this already. Thanks, good to know that it WILL work one day. Mine does not have any option to reduce the setting for pets. It seems that he is ok in other rooms just not the one where it is. I would hate to think he is constantly suffering from it. Does anyone else have any experience or advice with pets? I contacted the company who said ‘Pets can not hear it’. They can!! Kiama, one of my pest repellers has been plugged in a few feet away from my telly for the last 12 months and I haven’t noticed any adverse effects. It is still the older 4-in-1 that I originally posted about above, so I’m not sure what effect the newer 6-in-1 might have. Amanda, I wouldn’t say it definitely WILL work, I still get spiders – in fact I had a big one a couple of nights ago that quite happily sat 12 inches from the repeller, so they’re certainly not a sure fire thing. Perhaps some spiders are just deaf or something! However, I would give it longer though than a week though – let us know how you get on. That said, I’ve certainly had less spiders in the last twelve months, and the ones I do get are more often than not in a room without a repeller (I think the effective range is A LOT less than the manual says – assuming they work at all that is). But… I couldn’t say that any success I’ve had is entirely due to the repellers – it could also be because I’ve had some building work done, which may have reduced the entry points and/or the weather etc. For me, if they only help prevent a few big spiders a year though, that’s almost worth it! My husband bought four of these from that Bid-Up channel, 6-1’s they were. He knows how afraid i am of spiders and mice so he thought he would very kindly try to help or give him a break from my wining. We have a large house surrounded by fields and year the farmers harvest out house becomes a refuse for spiders and mice. Anyway i have had them plugged in for four weeks and the results are astonishing. Definatly no spiders or mice to report. I would not call the function a light on the machine though, more a relaxing calming light but lovely anyway. We even bought a set for our apartment in the canaries which as a cockroach problem and they even work on them, no more call out fees twice a year. I definatly reccomend them, i have a fobia about spiders so i would know if they work or not. I can’t wait for the 7-1. I wonder if you have a different brand/model or something? My other half set them up, we have two and i was curious to whether she had them on the correct setting, lo and behold she had them on UMI *rolls eyes*, typical lol. I am not sure I am using my repeller correctly, doesn’t seem to shift them. There are two settings on one side UMI1 and UMI2. Thought you just plug it in and go. Do you need the the blue light on for it to work? Maryann, the blue light on mine is just a night light. Presumably that’s the same for the newer 5-in-1 and 6-in-1 models? I would guess one of the UMI settings is the ‘sweep’ function described above, the other would then be just constant ultrasound. 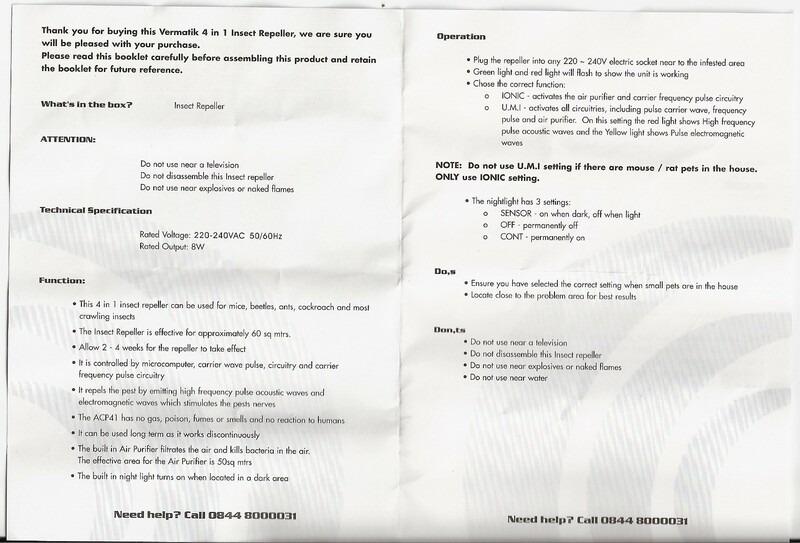 Might be wrong though – hopefully someone will scan the instructions for those two models and post them. Jojo, I can’t see any specific claims for fleas, just “most crawling insects”. Of course, whether these things work at all is still a bit undecided. Might be worth a go though if you’ve tried everything else. Thanks C. Thought the blue light was a night light and not in conjunction with it working to get rid of the beasts!! !